Herbs annual, with an acrid, watery juice, alternate, pinnatifid, exstipulate leaves. Flowers regular, 3 to 5-merous, perfect. Sepals united at base, persistent, valvate in aestivation. Petals marescent, hypogynous. Stamens twice as many as petals and inserted with them. Fil. opposite to the sep. with a small process outside the base. Ova. of 2 to 6 carpels. Sty. united. Stig. simple. Fr. 2 to 5 achenia, rather fleshy. Sds. solitary. Genera 2, species 8, mostly natives of the temperate parts of N. America. FLOERKEA, Willd. False Mermaid. (Named in honor of Floerke, a German botanist.) Sepals 3, longer than the 3 petals; stamens 6; ovaries 3, tuberculate, style 2-cleft. - Small aquatics, with pinnately divided leaves. Herbs or generally shrubs or trees, with the ex-stipulate leaves dotted with transparent glands containing aromatic or acrid oil. Flowers regular, 3 to 5-merous, hypogynous, perfect or polygamous. Stamens as many or twice as many as the sepals. C2S. Ruta graveolens, leaves, flower, fruit 9, Xanthoxylum, staminate flower; 630, pistillate flower. Pistils 2 to 5, separate or combined into a compound ovary, with as many cells, sessile or raised on a stipe (gynophore); styles mostly cohering. Fruit capsular, or separating into its component 1 or 2-seeded carpels. Genera 70, species 500 or more, generally natives of S. America and the temperate climes of other lands, few in N. America. They are generally possessed of a strongly aromatic, pun gent taste or fetid odor, antispasmodic and tonic properties. RUTEAE. Flowers perfect (Herbs. Stamens 10). Pistils 3 - 5, separate below. Stamens 3 - 6..
1. RUTA, L. Rue. Calyx of 4 to 5 sepals, united at base; petals 4 - 5, concave, obovate, distinct, torus surrounded by 10 nectariferous pores; stamens 10; capsule lobed. - Herbaceous or shrubby, mostly European. R. graveolens L. Common Rue. Suffruticous, nearly glabrous; lvs. 2 to 3-pinnately divided, segments oblong, obtuse, terminal ones obovate-cuneate, all entire or irregularly cleft; fls. terminal, corymbous; pet. entire. - Native of S. Europe. St. branched, 3 to 4f high. Lfts. 6 to 10" by 2 to 4", conspicuously dotted. Corolla yellow, 6" diam. Jn. - Sept. ‡. 2. DICTAMNUS, L. Fraxinella. 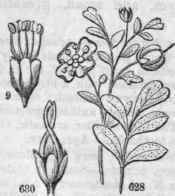 Calyx of 5, deciduous sepals; petals 5, unguiculate, unequal; filaments 10, declinate, with glandular dots; capsules 5, slightly united.- Herbs native of Germany. β rubra. Fls. purple; rachis of the leaves winged. 3. XANTHOXYLUM, L. Prickly Ash. (Gr. yellow, wood.) Sepals 4 or 5; petals 4 or 5, or wanting; stamens as many as the petals in , rudimentary in ; pistils 3 to 5, distinct below, with coherent styles, in fruit crustaceous; 2-valved, 1 or 2-seeded. - Shrubs or trees with sharp prickles, pinnate leaves, and small, greenish flowers. 1 X. Americanum Miller. Prickly; lfts. ovate, subentire, sessile, equal at base; umbels axillary; sepals 5, petaloid, petals wanting (more properly petals 5, calyx wanting). - A shrub 10 or 12f high, found in woods in most parts of the U. S. The branches are armed with strong, conical, brown prickles, with a broad base. Lfts. about 5 pairs, with an odd one, smooth above, downy beneath; common petioles, with or without prickles. Fls. in small, dense umbels, axillary, greenish, appearing before the leaves; seeds large, black. The bark is bitter, aromatic, and stimulant, used for rheumatism and to alleviate the toothache. A pr., May. 2 X. Carolinianum Lam. Prickly; lfts. falcate-lanceolate, very inequilateral, petiolulate; fls. in terminal, umbel-like panicles; sep. minute. - Southern States. Tree attaining considerable size. Some in woods N. of Montgomery, Ala., are nearly 40f high, with trunk 10 or 12' diam. Bark light gray, with the prickles protruding through large, corky cones. Lvs. 6 to 15' long, smooth and shining both sides. Lfts. 7 to 13, obscurely crenate-serrate, only the odd one equilateral. Fls. numerous, globular, finally expanded, and the 5 stamens exserted. Bark excessively pungent in taste. May. - The cone-like warts on the bark of the larger trees are very curious. 4. PTELEA, L. Shrub Trefoil. (Gr. the elm tree; from the resemblance of the fruits.) . Sepals 3 to 6, mostly 4, much shorter than the spreading petals; stamens longer than the petals and alternate with them, very short and imperfect in ; ovary of 2 united carpels; styles united, short or 0; stigmas 2; fruit 2-celled, 2-seeded samara, with a broad, orbicular margin. - Shrubs with 3 to 5-foliate lvs. Fls. cymous. P. trifoliata L. Lvs. 3-foliate, 1fts. sessile, ovate, short-acuminate, lateral ones inequilateral, terminal ones cuneate at base; cymes corymbous; stam. mostly 4; sty. short. - An ornamental shrub, 6 to 8f high, West. States, rare in W. N. York. Lfts. 3 to 4 1/2' by 1 1/4 to 1 3/4, the ped. rather longer. Fls. white, odorous, nearly i' diam. Samara nearly 1 diam. 5. AILANTHUS, Desf. Chinese "Tree-of-Heaven." (From the Chinese name, Ailanto.) Sepals 5, more or less united at base; petals 5; stamens 2 to 3; ovaries 3 to 5; styles lateral; fruit 1-celled, 1-seeded samarae, with oblong margins; stamens 10; ovaries, styles and samarae as in . - Oriental trees and shrubs with pinnate lvs. Fls. in panicles. Recently stationed in Order Simaiubaceae. A. glandulosa Desf. Lvs. glabrous, unequally pinnate, lfts. ovate or oblong-lanceolate, acuminate, shortly petiolate, with one or two obtuse, glandular teeth each side at base, terminal one long-petiolate. - A tree of large dimensions, and with luxuriant foliage. Trunk straight, with a smooth, brown bark. Lvs. 3 to 5f in length, with 10 to 20 pairs of leaflets, and an odd one. Fls. in terminal panicles, green, very ill-scented, rendering the tree a nuisance when in bloom (May and June). The rapid growth of this tree is its only recommendation as a tenant of our parks.